While in Paris for a reunion on the eve of World War II, Charlie finds that the murder of an hated businessman leads him to a conspiracy to smuggle arms to Germany. Capt. Johnson: [startled upon coming into the ship cabin] Pardon me, gentlemen, I thought this cabin was occupied only by the corpse. Charlie Chan: Sorry to disappoint. 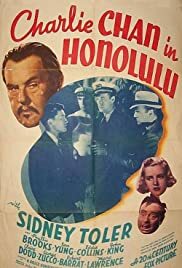 Sidney Toler makes his debut as Lieutenant Charlie Chan in this who-done-it mystery where the writer actually plants sufficient clues that the alert viewer might be able to ascertain the guilty party before all is revealed at the end. Bravo - the Warner Oland Chan movies rarely offer such a treat. Toler plays a more animated Chan than did Oland - most fans have their preference. This Chan moves fast and points out more clues along the way. The Toler series opens with a Chan family gathering and an impending birth of his first grandchild. Chan admits to having a total of 13 children of which 10 are sons. Son Lee's absence is explained as being in art school in New York and Victor Sen Yung (billed as Sen Yung) is introduced as Chan's #2 son James (as shown in closing credits). Jimmy both aids his Pop and hinders the investigation but wants to become a detective. In Charlie Chan at the Circus, Chan's #2 son is Charlie Jr., played by Layne Tom, Jr. In this new film, Layne Tom plays #5 son Tommy but the IMDb listing and all reviews show him as Willie. The closing credits clearly show Layne Tom playing the role of Tommy Chan and I never heard anyone refer to him by name - except perhaps the ship's Captain who says he is tired of this `tommyrot.' In this film, the Chan family is awaiting birth of first grandchild - this theme forming the basis of some good comedy throughout. The bulk of the story takes place aboard the freighter Susan B. Jennings that is taking a mixed cargo from China to the US. The cargo includes animals for a San Francisco zoo - to include Oscar the lion and Eddie Collins as a great comedic keeper. George Zucco is superb as the eccentric psychiatrist Dr. Cardigan who is keeping alive the brain of Chinese murderer Chan Ho Ping. The rest of the supporting cast does a credible job and the viewer is offered a menu of suspicious characters and planted clues. `Opinion like tea leaf in hot water - both need time for brewing.' Just stick to the main clues as they are revealed and you might just get to the end along with Lieutenant Chan. There are fewer racial slurs in this offering although the elder Chan makes reference to the `wrong flavor' when viewing a newly born black child. Probably too much time is spent with Oscar and Al but he is funny. Chan gathers everyone together at the end in the Captain's Cabin where he tricks the guilty party into taking a final incriminating step. The last scene is interrupted by a phone call from the hospital and the lights being turned off, but in the end, justice prevails. As in earlier Chan movies, the detective knows some facts that the viewer cannot know, but in this film those facts are not vital to figuring out the solution. By the way, the grandchild is a boy. Recommended.